For a second day in a row, Wiktoria’s ‘As I Lay Me Down’ remains the biggest Melodifestivalen hit on Spotify in Sweden. To note, she is not the top streaming hit. 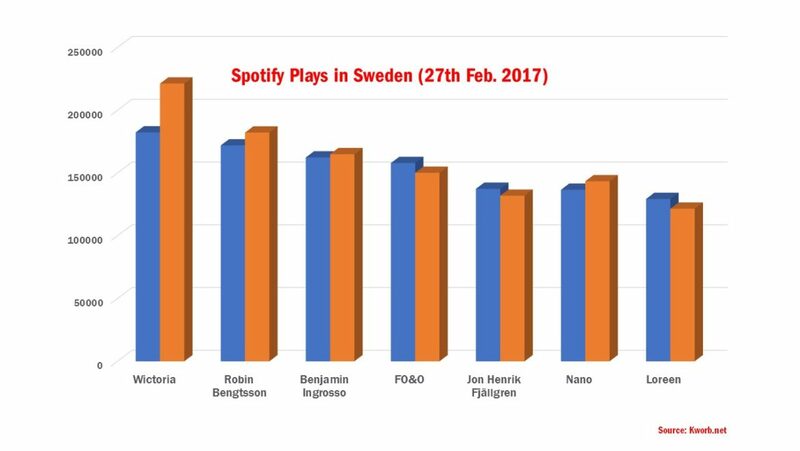 Robin Bengtsson’s ‘I Can’t Go On’ also adds more plays compared to the day before. Most tracks see gains, apart from Loreen. ‘Statements’ loses 7,759 spins. Yesterday, I wrote about the streaming response to the former Eurovision winner. The stats are lifted from Kworb.net, which compiles Spotify stats on a daily and weekly basis. Loreen’s team has high hopes that an audience will build up ahead of Saturday’s second chance competition. And many believe that she will win against Anton Hagman’s ‘Kiss You Goodbye.’ The Shawn Mendez-esque singer climbs closer to the Top 20. He has previously reached No.15 on the daily chart. As yesterday, Wiktoria, Robin Bengtsson and Benjamin Ingrosso remain the only Melodifestivalen entries in the Top 10. One of my favorites – Marielle’s ‘A Million Years’ is struggling at 108,555 daily spins (No.23). I had great expectations for that track and am sure that it will be highly positioned in the final. As I previously wrote, Wiktoria is not the top streaming hit. These are the most popular tracks in Sweden as of 28th February. Check out WelcheMusic.com for more updates!